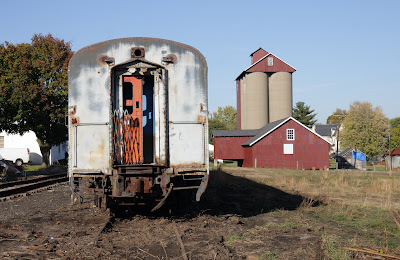 There is something so sad about rail equipment in that condition. Maybe I feel that because I have been a rail fan for a long time! It's eqiupment from the old Octoraro Railroad, which went under some years ago. The line was then run by Morristown & Erie Railway until '04 and is now served by East Penn Railway. It was the PRR Octoraro branch many years ago. I don't know who owns the former Octoraro Rly equipment. There is also a switcher rotting somewhere else along the line, can't remember where though.